As I was flipping through the recipes when I brought the box home, I came across one that made me stop. It was for Swedish Pancakes. My grandmother has a recipe for Swedish Pancakes that has been a family favorite for as long as I can remember. Every time we’re at a restaurant and see them on the menu, we get an order to see if they’re as good as my grandmother’s. They never are. So when I saw this recipe in the box, I knew it had to be the first one I tried. The ingredients are the same as my grandmother’s recipe, but the amounts are a little different. For example, there is three times more milk in this one, which caused the consistency to be a lot thinner than what I’m used to. They were really hard to flip and unfortunately, most of my “pancakes” look more like amorphous gelatinous blobs than edible breakfast food. Also, this recipe called for the flour to be sifted. I don’t own a sifter. I used a cheese grater. Not the best solution. Sadly, I don’t think I can blame my non-flipping pancakes on lumpy flour.They were, however, edible and reminded me of crepes (which I hear are also very difficult to flip successfully). Even though they were tasty, Mimi, yours are still my favorite and always will be. 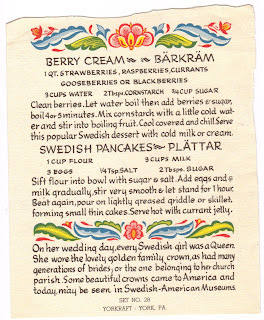 At the top of the clipping is a recipe for Berry Cream or Barkram (a Swedish dessert). It suggests serving it with cold milk or cream. I chose vanilla ice cream – probably not a very traditional way to serve it, but it was good! I think it would also be good served as a shortcake dessert or with angel food cake. It makes a large quantity so this would be a good dish to bring to a summer picnic or barbeque when berries are in season and plentiful in the grocery store. There is a tidbit about Swedish wedding traditions on the bottom of the clipping that is very interesting. 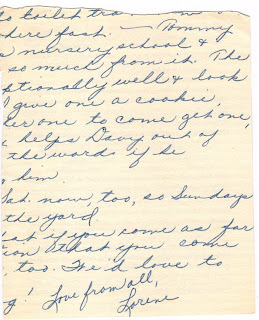 I also scanned in the back of the clipping because it was part of a letter signed by a woman named Lorene. You only get small snippets of the conversation, but sometimes it’s more fun to fill in the blanks on your own. We do enjoy crepes and Swedish pancakes. I do use a flat cast-iron skillet and was taught from a friend you use a long straight spatula to turn them. It took me awhile, but I can finally do it. And she also puts butter down on the skillet after each pancake. Enjoying you blog, I like the information on that little paper about the queen bride. How fun to find something that reminds of us of our families, what a treasure! I made the pancakes. I did decrease the milk to just 1 cup. I used whole wheat flour and natural whole sugar and my little girls ate them up like cookies. They absolutely LOVED them and they are super simple to make. Who would've thought you could just use a few ingredients?